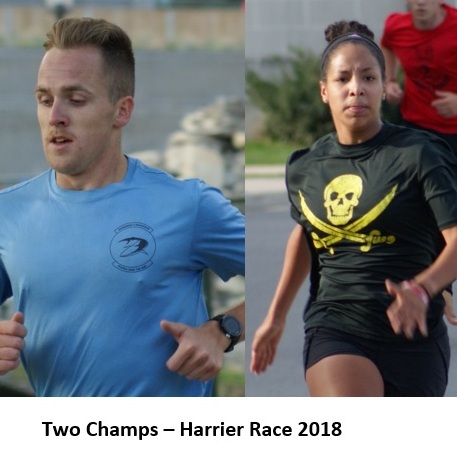 On Saturday, 8 September 2018, RMC hosted its fall Wing wide Sports Day, which kicked off with the 5km Harrier race. Form-up was at 0730, where the race participants gathered to collect their electronic running chips, and the Squadrons ramped up their pride. The Wing was then addressed by the Commandant of the college, BGen. Bouchard, before warming up and making their way to the starting line. 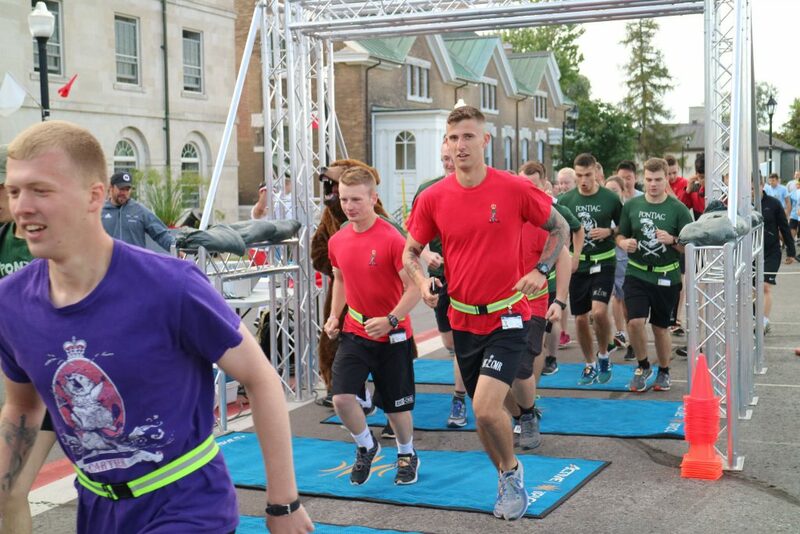 The fastest 10 runners of each Squadron were given priority at the starting line so that they would not be slowed down by the people they would pass. The fastest male runner was OCdt Roots, who just last weekend broke 6km a course record at SUNY Poly. Following Roots’ time of 15:18 were OCdt Welsh and then OCdt App. The fastest female runner and winner of the 3252 Ted Tromanhauser Cup was, unsurprisingly, co-captain of the RMC competitive running club OCdt Oleksin, who ran the race in 21:57. She was followed across the finish line by OCdt Perigo shortly after, with OCdt Strots in third place. 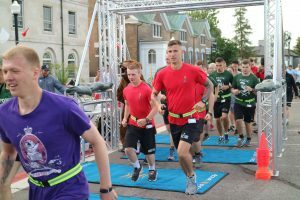 Half of the previously mentioned Cadets are part of the Sandhurst team, which is a clear demonstration of the team’s quality again this year. With an average time of 25:22, 2 Squadron was named the fastest this year, earning their first accolade of the day. “Your story about the Harrier’s race reminded me of one of the funniest thing that happened while I was at the college, (1956-60). In 1958 the race started in front of Fort Haldimand. Sgt. Major Coggins made sure the starting shotgun was cleaned and properly loaded and sharply presented it to Cmdr. Debbie Piers. After the prescribed, barked out, “Ready, Get set,” the Commandant raised the gun and fired. As the above sports wound down, competitive and recreational clubs at RMC set up tables to recruit new members on the Parade Square during Recspo. Judo set up their mats and put on a demonstration, while sailing displayed one of their boats. Military Skills used a massive tire to test the physical prowess of potential members, and rowing brought a pair of ergs. New and established clubs alike collected signatures of up to 70 new members for the upcoming year. After a BBQ lunch, only one activity remained: Tug of War. In the double-elimination challenge, ALOY put forward an impressive showing, but the final was ultimately decided by a faceoff between 1 Squadron and 2 Squadron. Rope burned hands gripped one last time, and 2 Squadron came away the winners. The tug-of-war victory gave 2 Squadron the required points to be named the overall winners of Sports Day. OCdt Nicole Strickland, who missed an earlier badging parade due to her ongoing battle with leukemia, made a surprise visit, and was presented with the award for the second year RMC Cadet attaining the highest physical fitness score. In her absence, Strickland’s fellow RMC students raised nearly $3,000 in donations, reinforcing the level of support she has within the college family. 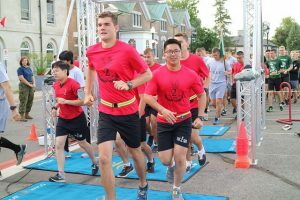 Overall, Saturday was another impressive showcase of RMC Cadets’ esprit de corps, showing how far a little friendly competitive can go.